Spatial thinking concerns shapes, locations, paths, relations among entities and between entities and frames of reference. We remember this kind of information, and we also mentally transform it to support manipulating objects and constructing new ones, and for navigating the physical world. Spatial thinking is increasingly recognised as an important aspect of human cognition generally, and as central to scientific and mathematical thinking more specifically. The case for this idea used to rest on somewhat shaky grounds: anecdotes from famous scientists and mathematicians, the face validity of the claim when looking at the kinds of problems and data displays that scientists and mathematicians use, and a sprinkling of cross-sectional correlations. But over the past few decades, the evidence has become firmer and is now based on more rigorous designs. Camilla Benbow, David Lubinski and Jonathan Wai published data from several large longitudinal data sets, with good statistical controls, showing that spatial skills in high school predict choices of university disciplines and life-long careers. One of their most notable papers, published in the Journal of Educational Psychology in 2009, was based on Project TALENT, a very large and lengthy study of the careers of Americans who were high school students around 50 years ago. Moving downward in the age range, Liz Gunderson, Susan Levine and collaborators showed in 2012 that there is longitudinal prediction of elementary school mathematical thinking from spatial skill in kindergarten. Pushing the developmental horizon even further back, Brian Verdine, Roberta Golinkoff, Kathy Hirsh-Pasek and I have a monograph in press with the Society for Research in Child Development, showing prediction of kindergarten mathematics skills from tests assessing three-year-old children’s ability to copy two- and three-dimensional shapes. So, across the developmental continuum, and controlling for verbal ability (and sometimes for other cognitive factors such as executive function, and exogenous factors such as socio-economic status), better spatial skills predict better mathematical skills and more interest and persistence in science. If spatial skills were fixed and unchangeable, this news might be good for some people and bad for others. Luckily, the skills are malleable. There has been a lot of work on this topic, so David Uttal and I with a team of colleagues conducted a review of the studies, published in Psychological Bulletin in 2013. Our meta-analysis showed moderate to moderately large effect sizes for training spatial skills. The effects appeared for adults as well as children, for women as well as for men, and across a broad range of types of spatial skill. Furthermore, the effects lasted at least a few months (as long as researchers had dared to assess durability) and transferred at least somewhat (about as far as researchers had dared to assess transfer). So the pressing task before our field is to leverage these results by finding the best ways to instruct or educate young children in spatial skills. Why young children? I think the best focus is on preschoolers, not because adults can’t learn new skills but because it’s helpful to launch children on trajectories in which they learn robustly from the start and hence have a range of career choices. Here, I’ll discuss three approaches to establishing an early spatial foundation by looking at one topic in preschool education: how young children learn shapes. Shape learning is often included on lists of what preschoolers should master before beginning formal instruction, along with counting to 20 or knowing the alphabet. How best to do it? Instruct. Educate. Learn. These words all seem pretty similar. Children learn adult skills because we instruct and educate them. But the three verbs are subtly different, and turn out to correspond to three distinctive theories of cognitive change. Instruct comes from a Latin verb instruere, meaning to ‘build’. That’s empiricism – an ‘outside in’ or show-and-tell process. Educate comes from a different Latin verb educere, meaning to ‘lead out’. So it evokes a Socratic process in which the educator leads children (or novices) to realise that they know things that they already actually know. That’s nativism. Learn comes from the same root word as the German verb lernen, and means, well, to learn. Learning shifts our focus from the person who knows more (the educator or to) to the person who knows less, the learner. That’s constructivism. A great deal of what has been written about empiricism, nativism and constructivism over the years is quite abstract. Yet these contrasting ways of thinking have concrete consequences for specific and practical topics. In cognitive development research, there has been a sequence of fashionable theoretical approaches. I discuss them here as they apply to shape learning. At first blush, shape learning doesn’t seem that hard to accomplish. 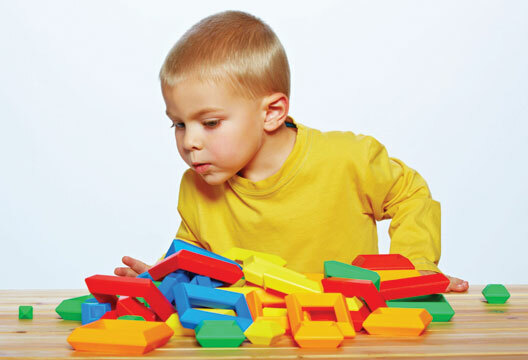 It’s simple enough to give toddlers shape sorters, or for three-year-olds to play with shape puzzles or to look at books about triangles and squares. Empiricists would suggest that children learn to associate the word triangle with a certain shape, square with another shape, and so forth. And shape learning is checked off the cognitive checklist – done! But this apparent simplicity is deceptive, and over 50 years ago, constructivism replaced empiricism as the predominant way to think about development and education. Although the field of cognitive development moved on from constructivism, many educators even today are very influenced by Jean Piaget, who famously espoused a version of constructivism that also emphasised stages, and an age-linked view of what children are cognitively ready to tackle. Piaget wrote a whole book on the gradual development of relevant geometrical concepts along with his collaborators Barbel Inhelder and Alina Szeminska, The Child’s Conception of Geometry. A simple take-home message of that book would certainly be that shape sorters, shape puzzles and shape books are not enough – children’s conceptions of angles and so forth takes a long time of active interaction with the environment to become formally specified. A constructivist approach to shape learning was also supported by a Dutch husband-and-wife team called van Hiele, who focused specifically on geometric shapes and delineated a sequence of understanding that spanned five levels. The first level was called level 0. At the starting point, children were said to understand shape only holistically, in terms of familiar objects that the shape resembles (for example, 'triangles that look like ice cream cones'), and to over-emphasise irrelevant features of the displays, such as orientation. The van Hieles suggested that many adults never reach the highest levels, despite formal education in geometry. These themes were taken up in the United States by Doug Clements and Mike Battista. Through their influential work and other research, standards for instruction and guidelines for education in mathematics now emphasise gradual development and imperfect adult attainment. The constructivist perspective has been startlingly contradicted, however, by more recent work on geometry and shapes from a nativist perspective. In a series of articles by Pierre Pica, Liz Spelke, Stan Dehaene, Veronique Izard, and other colleagues, summarised in a book chapter in 2011, children and adults took a very simple test. They looked at panels of six figures and picked the odd one out. Four examples are shown below. The most directly relevant panel for shape learning is the leftmost, where the correct answer is the only choice with three sides and three corners, the triangle. But the other items also assess important geometric concepts. Children do pretty well on this test, although adults do better. In addition, people from a non-schooled culture with few material possessions (a tribe in the Amazon basin called the Mundurucu) do pretty well, though people from European cultures do better. This work suggests that most geometric concepts are known without instruction. Shades of Socrates! Based on such findings, the group has claimed that geometric knowledge is part of core knowledge, an innate system that can be supplemented by instruction, but that is universal and that does not require instruction or education. The nativist approach hasn’t yet influenced the world of mathematics education too much, but its basic message would seem to be very optimistic – education can build on solid bases in geometric understanding. It would be hard to imagine a more striking contrast than the one between the nativist perspective and the work of Piaget and the van Hieles. Children either have core knowledge from the start, or know very little and develop very slowly. Neither position agrees with simple empiricism – Show them the toys and they shall learn. So who’s right? What’s a concerned parent or a motivated geometry teacher to do? One way to proceed is to synthesise the best aspects of each of the three approaches, in a mode of thought that some people call neoconstructivism. My starting point in thinking about a neoconstructivist approach to shape learning was a study I did with Eric Satlow that appeared in Cognitive Development in 1998. We documented two different problems that affect children’s shape learning. In our experiments, we showed children from three through nine years a variety of shapes. We also studied a comparison group of adults, who performed very well and gave us a benchmark of competence. Participants were told that a puppet had a very specific kind of thing that they liked, and they were shown some examples of exactly what the puppet liked. They were also told that anything that was different from what the puppet liked should be thrown into a trash bin, because the puppet would reject it. On this sorting task, even the three-year-olds did pretty well at accepting prototypical shapes on behalf of the puppet, such as the triangles in Figure 1. (That’s analogous to picking the triangle on the task that Mundurucu children do well at.) But preschoolers also thought the puppet wouldn’t mind getting triangles with little flattened corners (that were thus really four-sided figures) or with little gaps in their outlines (that thus weren’t closed figures at all). School-aged children knew that those formal properties – a certain number of lines and angles with no cheating, and closure – were necessary, and so rejected such shapes. But surprisingly, preschoolers also remained pretty suspicious about atypical-looking examples of triangles that met the formal definition of a closed figure with three sides and three vertices. That is, they often threw in the trash bin figures such as a scalene triangle with one side much longer than the others, shown at an odd orientation. Apparently, they thought that only the perky little equilateral triangles with a point facing skyward were ‘real’ triangles. What’s going on here? Empiricists might argue that the fault lies with the nature of the input, and they have a bit of a point. Most shape sorters use canonical shapes – equilateral triangles, not scalene ones. So do shape books. Parents and teachers rarely use shape terms at all, and when they do, it’s often to refer to the canonical shapes. It’s as if we talked about dogs only with respect to cocker spaniels, ignoring dachshunds, greyhounds and the rest of the canine kingdom. We could hardly be surprised if children thought that dog meant ‘cocker spaniel’. Or a better analogy, given that we talk a lot about dogs but only rarely shapes, might be if we talked about tools while referring only to rakes. Wouldn’t children think that tool meant ‘rake’? But to fault the input isn’t to embrace empiricism. We know that word learning necessitates much more cognitive equipment than blank-slate empiricism would postulate. A wealth of research has shown that children come equipped with some hypotheses and preferences, develop others, and learn actively from their mistakes. Shape learning is no different from other kinds of vocabulary learning; it’s just a pity that the input is impoverished. How do we enrich the input? One obvious recommendation is to increase the range of examples offered to encompass unusual instances. Another recommendation is to keep the interactions playful not didactic. Little kids should play, not sit still for formal instruction! If they are guided in their play, they learn as much (and more) about shapes as if they are instructed, as Kelly Fisher, Kathy Hirsh-Pasek and I showed in an article in Child Development in 2013. A last recommendation is to be cautious with electronic toys. In research published in 2015 with Jen Zosh and others we found that traditional toys are associated with more use of shape language by parents than play with electronic toys. The idea that children actively construct their ideas of shape, sometimes over an extended number of years, in a way that depends on rich and playful input, is a far cry from empiricism, and different from traditional constructivism, which at least in popular versions of Piaget has emphasised sequences with rather rigid age norms. The approach also encompasses nativism in recognising the strong starting points that babies and toddlers bring to the task of learning. Infants distinguish among shapes in habituation paradigms, and children as young as two and a half years can pick out specific shapes in forced-choice tasks. But strong starting points are not mature ending points. One way to think about what develops from infancy to adulthood in a variety of cognitive domains is that there is progress from implicit to reflective knowing, a process that Annette Karmiloff-Smith has labelled representational redescription. Of course, infants and indigenous peoples have strong capabilities. Of course, children need to learn more to go beyond those beginnings. Education and instruction provide the raw materials within which active learners go further. Clements, D.H. & Battista, M.T. (1992). Geometry and spatial reasoning. In D.A. Grouws (Ed.) Handbook of research on mathematics teaching and learning (pp.420–464). New York: Macmillan. Fisher, K.R., Hirsh-Pasek, K., Newcombe, N.S. & Golinkoff, R.M. (2013). Taking shape: Supporting preschoolers’ acquisition of geometric knowledge through guided play. Child Development, 84, 1872–1878. Gunderson, E.A., Ramirez, G., Beilock, S.L. & Levine, S.C. (2012). The relation between spatial skill and early number knowledge. Developmental Psychology, 48(5), 1229–1241. Izard, V., Pica, P., Dehaene, S. et al. (2011). Geometry as a universal mental construction. In E. Brannon & S. Dehaene (Eds.) Space, time and number in the brain (pp.319–332). London: Academic Press. Uttal, D.H., Meadow, N.G., Tipton, E. et al. (2013). The malleability of spatial skills. Psychological Bulletin, 139, 352–402. Wai, J., Lubinski, D., & Benbow, C.P. (2009). Spatial ability for STEM domains. Journal of Educational Psychology, 101(4), 817–835. Zosh, J.M., Verdine, B.N., Filipowicz, A. et al. (2015). Talking shape: Parental language with electronic vs. traditional shape sorters. Mind, Brain and Education, 9, 136–144.